UNITED NATIONS, August 8 -- Days before the military government in Myanmar will announce its verdict on democracy leader Aung San Suu Kyi, three exiled Burmese leaders came to the UN in New York and told the Press of a "Proposal for National Reconciliation." Inner City Press asked "prime minister in exile" Sein Win about the Constitution that was pushed through in the wake of Cyclone Nargis, and under which the UN is reportedly considering working with the regime on a 2010 election. Sein Win said that the under the constitution, the Commander in Chief, who must have a military background, appoints 25% of the seats. Since the Constitution can't be amended with less than 75% of votes, he said, the military essentially has a veto over any amendments. Inner City Press asked about the reports of North Korea assisted tunnels and nuclear developments in Myanmar. Foreign minster in exile U Bo Hla-Tint said that the reports are worrying, and that the UN Security Council should take them seriously. Ban Ki-moon, when Inner City Press asked him this week about the reports, replied that he had no information, no substantial information. Previously, Ban's envoy to Myanmar Ibrahim Gambari told Inner City Press that the Rohingya, Muslims so mistreated in Myanmar they take to the seas, facing further abuse in Thailand and elsewhere, are not within his mandate. Inner City Press asked the trio who their proposal deals with Rohingya. 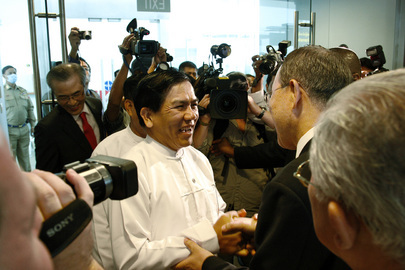 "They are citizens of Burma," said NCUB General Secretary (in exile) U Maung Maung. 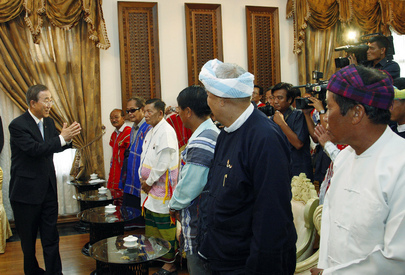 He added that Burma does not need a nuclear reactor, on which he said Russia is helping. We already sell gas to Thailand, he said. "Burma does not look forward to being a nuclear state." The trio was not able to meet with Ban's envoy, Ibrahim Gambari. Later, several Ban advisers moaned that "we're going to get demarched on Monday, why did you not receive, etcetera." The Ban advisers said of the Burmese trio that they are "nice guys" but "getting older and older" and "desperate." A wire service journalist opined that his Asian bureau opined that "the generals will never listen to them." It was, then, sad. But heartfelt. We'll have more on this. Footnote: The August 7 press conference was organized and promoted by Independent Diplomat, which also at the UN pushes issues of climate change and small states and Western Sahara, among others. On the latter, a UN staffer recently marveled at Polisario's representative in Australia signing deals with Australian energy companies for some future date, while the UN and its Office of Legal Affairs has strikingly declined to comment on complaints that Morocco is illegal moving to exploit energy and other resources. The National Coalition Government of Burma press release, seemingly referring to U.S. lobbying rules, says that "more information is available at the Department of Justice." Might DOJ have information or views on the legality of Morocco's exploitation of Western Sahara? Or might the War on Terror, even under Obama, still seem more important? UNITED NATIONS, August 5 -- Emerging from a meeting with his Group of Friend on Myanmar, UN Secretary General Ban Ki-moon was asked by Inner City Press what he makes of reports that Myanmar is developing a nuclear reactor or even, in an early stage, nuclear weapons with the assistance of North Korea and Russia. "I do not have any information on that," Mr. Ban replied, "therefore I am not able to comment on that." Afterwards, a senior Ban advisor told Inner City Press that Mr. Ban had been prepared to answer the question, and that the planned if-asked talking point was that the UN does not have an substantial or verifiable information, but that if it is true, it is a matter of grave concern as this is precisely the moment the international community should be driving toward non-proliferation. Oh that Ban had said that. It was also explained to Inner City Press that if it had managed to ask if Ban favors modification of the country's constitution, pushed through in the wake of Cyclone Nargis, which devotes 25% of seats to people with military backgrounds, Ban probably would not have answer. "The Group of Friends is divided on that," the source explained. He argued against the theory that the timing of Wednesday's meeting was meant to allow Ban, before he set off on vacation, to speak his piece Myanmar. Rather, he said, some thing that Myanmar blinked on July 31 and put off the Aung San Suu Kyi verdict. With another statement, perhaps they'll think hard about what verdict to impose. But again, Inner City Press asks, not without sarcasm, does that mean Ban questions the separation in Myanmar between the judicial and executive - or military - branches of government? We're not commenting on that, a UN official answered. Nor about the Constitution. Watch this site.